I’ve been paying attention to my own perfectionism lately. This is no doubt influenced by Saturn’s transit of Virgo (begun Sept. 2007, lasting till Jul. 2010). Saturn is about buckling under and doing the work. Virgo is how to do it better. When Saturn entered Virgo, I knew this would be an issue. Saturn’s job is to make sure we get to the very bottom of each sign—it’s gifts and its warts. And Saturn doesn’t mind giving us the warts until we decide we’ve had enough. Have you had enough of your own perfectionism yet? Planets ebb and flow through the signs. When they are moving direct, it is like the tide coming in—new nutrients flood the tidal pool. When they station retrograde the tide turns, flowing back out, changing the habitat. Since entering Virgo, Saturn has already had the first turning of the tide when it turned retrograde in December 2007 at 8 degrees Virgo. Saturn traveled all the way back to 1 degree Virgo in May when the tide turned again. It is now moving direct, the only outer planet to be moving direct this summer. Virgo, warts and all, is returning with a force. As the tide of the other planets retreat, only Saturn is bringing in fresh nutrients to the tidal pool. It is an excellent opportunity to pay attention to the invitation to ponder all Virgo traits, including perfectionism. This lunar month begins with the New Moon in Cancer, the Crab—appropriate for all these tidal pool images. Cancer is the fertile womb, the nurturer, the pool teeming with life and providing more life for others. This creative energy of possible abundance is meeting the finicky Virgo energy of process and perfection. This can be a really good thing if we can let go of perfection and use Virgo to take the next step and the next step and the next, in whatever we are nurturing this season. The gift of Virgo is the ability to focus on process rather than outcome. At times, we need to use this gift of near-sightedness when the dreamed of outcome seems too daunting. New Moons are excellent times to set intention. In the New Moon chart, Mars is at 0 degrees Virgo, conjunct Saturn at 4 degrees Virgo. These planets come together every two years to initiate another cycle of acting within ambition and boundary. 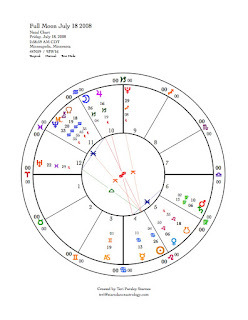 Jupiter in Capricorn opposite Venus in Cancer also highlights ambition in this chart. Venus is calling Jupiter back to the tidal pool of feeling, caring, accommodating others. Jupiter entered the sign of Capricorn in December 2007. It leaves this sign in January 2009. This energy has encouraged long-range planning. Getting down to business. Professional goals. Jupiter, in his expansiveness, can lose track of balancing energies. Cancer pulls back on Capricorn, telling us to remember the soul in our ambitions. The Sun and Moon at 11 degrees Cancer is acting within this opposition as well. At this New Moon, Mercury is nearing the end of its entire retrograde cycle. 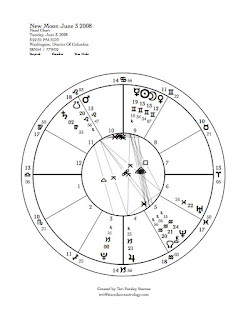 Back in May, Mercury stationed retrograde at 21 degrees Gemini, square to Uranus at 22 degrees Pisces. 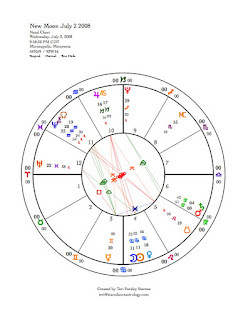 In this chart, Mercury has reached 20 degrees Gemini again, about to exactly square Uranus, which is still stationary at 22 degrees Pisces. When these two planets are in dynamic relationship, we can expect both brilliance and disruption. How has this Mercury retrograde cycle influenced you? Think back over your experiences with thought and communication over the past month. Can you apply these lessons to any intention you set this month? The Full Moon is a time for illumination. On July 18, the Full Moon chart shows that the conjunction between Mars and Saturn is separating. This new cycle of form and action has begun. Also at this time another planet opposes Jupiter. This time it is Mercury in Cancer. The first two weeks of this lunar cycle were about finding the balance between Cancer and Capricorn. This Full Moon illuminates that balance. Has anything happened in your life to force that issue? Or have you been able to gracefully welcome back the feeling tone of Cancer into your life? Mercury’s job is to give those lessons expression. Perhaps the best way to do this is tell someone else how much they mean to you. The heart of Cancer and the process of Virgo are allies this month for reconnection and balance. This poem by Sri Chinmoy reminds us to let go of grandiose outcome. His God wants him to accomplish. Gemini is the time of pollinating, connecting, and learning. This New Moon is an opportunity to surrender to all things Gemini. Even though we may feel that we have a lot to accomplish, the message from the stars is to enjoy the garden and allow serendipity to guide us. The New Moon chart shows a brilliant cluster of planets in Gemini. Of course, the Sun and Moon are together as they are at every New Moon and they are humming amidst a tight embrace of Venus on one side and the lord of Gemini himself, Mercury, on the other. We are being treated to a retrograde Mercury as well. Gemini is a youthful sign. Puck, from A Midsummer Night’s Dream is a good Geminian character, flitting about within the drama—observing, laughing, and stirring up more trouble. This Mercury is like that. The mischief deepens as retrograde Mercury is squaring another type of trickster: Uranus. With Uranus the Awakener involved in this lunar cycle, we may just experience the kind of tricking that can awaken us from illusion and set our steps upon a new path of authenticity. See last month for the important dates of this journey of Mercury retrograde. Retrograde planets are an important signature of this month and the summer season. The retrograde energy emphasizes fine-tuning and turning within. At the New Moon, not only is Mercury retrograde but Pluto, Neptune, Chiron and Jupiter are as well. Later this month, Uranus will join the list of retrograde planets. During retrograde, planets are revisiting territory in the zodiac. When the planets are moving direct into new territory in the zodiac, we tend to respond by moving into new territory ourselves. When the planets are returning to places they have recently visited, we too can slow down and root ourselves. This slowing-down impetus is in contrast to the Gemini impulse of speeding up and flying about. This should set up an interesting push-pull dynamic that may create frustration or confusion. My intention is to notice when I can let of moving forward and let myself instead be moved by the present moment. 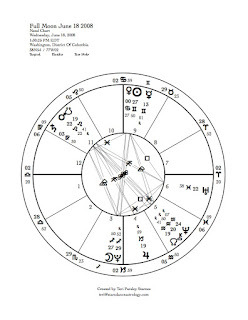 At the Full Moon on June 18, Mercury is still retrograde (but stations direct the next day) and the Sun and Moon are aligned with Pluto, which is returning for his last transit into Sagittarius. Pluto uncovers shadow, regurgitates dysfunction, and revitalizes life force. Since 1995 Pluto has been moving through Sagittarius, uncovering all types of fundamentalism, fear of foreigners, and small-minded belief systems. What else have you learned from Pluto? These last few months of Pluto moving through Sagittarius are an opportunity to reclaim Pluto power in these realms. Pluto will enter Capricorn for a nice long spell on November 26, in time for getting to work on the new realities of the 21st century. This Full Moon should illuminate Pluto themes. The Summer Solstice begins on June 20 when the Sun enters Cancer—a sign of home and nurturing. With all the retrograde energy, this summer may be a good time to stay home and reorient ourselves to the coming new world. A major configuration of the Solstice chart is a grouping of planets called a Boomerang Yod. The Yod is a triangle involving two quincunx aspects and a sextile aspect that forms a triangle. The apex planet of the Yod receives a lot of pressure. The Boomerang is an opposition between the apex planet and one or more planets. The apex of this Yod is Mars in Leo conjunct the South Node opposing a cluster of energy in Aquarius: Neptune, Chiron and the North Node. The nodes of the Moon describe karmic lessons (South Node) and evolution (North Node). This dynamic of the Summer points to evaluating our experiences with leadership, self-worth, and our need for affirmation so that we can evolve towards a more global viewpoint that is not so personally oriented. This evolution may encounter hidden areas that need healing—another reason that we may learn a lot this Summer by slowing down and nurturing ourselves and our loved ones so that we can respond to our global needs in the Fall. The sextile portion of this Yod is a harmonious relationship between Uranus and a conjunction of Moon/Jupiter. This energy speaks to an alignment of the conservative energy of Capricorn working with our ability to use intuition for change in the world. We are asked to get real and dream big at the same time. If there ever was a time for this to be possible it is now. In spite of the obvious and dire-seeming changes in store for us as we address global issues in the future, this month of Puckish Gemini reminds us to find allies in the unexpected, to slow down enough to enjoy the garden, and believe in our essential worth. This poem by Hafiz describes the power of Gemini. now joyously break their vow of silence. You too—weed out those roots of sadness from your heart. The Way of Truth, learn from the clarity of water. Learn freedom from the spreading grass. f the fields of hyacinth flowers. its love-crazed cry like a thousand-trumpet blast. of the Fair Ones and the Goblet of Wine. There is more true work in smelling the flowers than we usually acknowledge. May this season bless this work.